Urbanization occurs either organically or planned as a result of individual, collective and state action. Living in a city can be culturally and economically beneficial since it can provide greater opportunities for access to the labor market, better education, housing and safety conditions, and reduce the time and expense of commuting and transportation. Condition like density, proximity, diversity, and marketplace competition are elements of an urban environment that deemed positive. However, there are also negative social phenomena that arise, alienation, stress, increased cost of living, and mass marginalization that are connected to an urban way of living. Suburbanization, which is happening in the cities of the largest developing countries, may be regarded as an attempt to balance these negative aspects of urban life while still allowing access to the large extent of shared resources. In cities, money, services, wealth and opportunities are centralized. Many rural inhabitants come to the city to seek their fortune and alter their social position. Businesses, which provide jobs and exchange capital, are more concentrated in urban areas. Whether the source is trade or tourism, it is also through the ports or banking systems, commonly located in cities, that foreign money flows into a country. Many people move into cities for the economic opportunities, but this does not fully explain the very high recent urbanization rates in places like China and India. 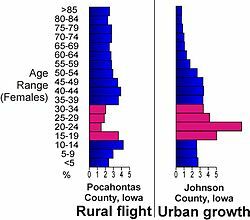 Rural flight is a contributing factor to urbanization. In rural areas, often on small family farms or collective farms in villages, it has historically been difficult to access manufactured goods, though the relative overall quality of life is very subjective, and may certainly surpass that of the city. Farm living has always been susceptible to unpredictable environmental conditions, and in times of drought, flood or pestilence, survival may become extremely problematic. In a New York Times article concerning the acute migration away from farming in Thailand, life as a farmer was described as "hot and exhausting". "Everyone says the farmer works the hardest but gets the least amount of money". In an effort to counter this impression, the Agriculture Department of Thailand is seeking to promote the impression that farming is "honorable and secure". However, in Thailand, urbanization has also resulted in massive increases in problems such as obesity. Shifting from a rural environment to an urbanized community also caused a transition to a diet that was mainly carbohydrate based to a diet higher in fat and sugar, consequently causing a rise in obesity. City life, especially in modern urban slums of the developing world, is certainly hardly immune to pestilence or climatic disturbances such as floods, yet continues to strongly attract migrants. Examples of this were the 2011 Thailand floods and 2007 Jakarta flood. Urban areas are also far more prone to violence, drugs, and other urban social problems. In the United States, industrialization of agriculture has negatively affected the economy of small and middle-sized farms and strongly reduced the size of the rural labour market. Particularly in the developing world, conflict over land rights due to the effects of globalization has led to less politically powerful groups, such as farmers, losing or forfeiting their land, resulting in obligatory migration into cities. In China, where land acquisition measures are forceful, there has been far more extensive and rapid urbanization (54%) than in India (36%), where peasants form militant groups (e.g. Naxalites) to oppose such efforts. Obligatory and unplanned migration often results in rapid growth of slums. This is also similar to areas of violent conflict, where people are driven off their land due to violence. Bogotá, Colombia, is one example of this. Cities offer a larger variety of services, including specialist services not found in rural areas. These services requires workers, resulting in more numerous and varied job opportunities. Elderly people may be forced to move to cities where there are doctors and hospitals that can cater for their health needs. Varied and high quality educational opportunities are another factor in urban migration, as well as the opportunity to join, develop, and seek out social communities. Urbanization also creates opportunities for women that are not available in rural areas. This creates a gender-related transformation where women are engaged in paid employment and have access to education. This may cause fertility to decline. However, women are sometimes still at a disadvantage due to their unequal position in the labour market, their inability to secure assets independently from male relatives and exposure to violence. People in cities are more productive than in rural areas. An important question is whether this is due to agglomeration effects or whether cities simply attract those who are more productive. 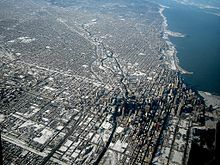 Urban geographers have shown that there exists a large productivity gain due to locating in dense agglomerations. It is thus possible that agents[clarification needed] locate in cities in order to benefit from these agglomeration effects. The dominant conurbation(s) of a country can benefit to a greater extent from the same things cities offer, making them magnets for not just the non-urban population, but also urban and suburban population from other cities. Dominant conurbations are quite often primate cities, but do not have to be. For instance Greater Manila is rather a conurbation than a city: its 20 million overall population (over 20% national population) make it very much a primate city, but Quezon City (2.7 million), the largest municipality in Greater Manila, and Manila (1.6 million), the capital, are not. A conurbation's dominance can be measured by output, wealth, and especially population, each expressed as a percentage of an entire country. Greater Seoul is one conurbation with massive dominance over South Korea, it is home to 50% of the entire national population. Though Greater Busan-Ulsan (15%, 8 million) and Greater Osaka (14%, 18 million) exhibit strong dominance in their respective countries, they are losing population to their even more dominant rivals, Seoul and Tokyo respectively. As cities develop, effects can include a dramatic increase and change in costs, often pricing the local working class out of the market, including such functionaries as employees of the local municipalities. For example, Eric Hobsbawm's book The age of revolution: 1789–1848 (published 1962 and 2005) chapter 11, stated "Urban development in our period [1789–1848] was a gigantic process of class segregation, which pushed the new labouring poor into great morasses of misery outside the centres of government and business and the newly specialized residential areas of the bourgeoisie. The almost universal European division into a 'good' west end and a 'poor' east end of large cities developed in this period." This is likely due the prevailing south-west wind which carries coal smoke and other airborne pollutants downwind, making the western edges of towns preferable to the eastern ones. Similar problems now affect the developing world, rising inequality resulting from rapid urbanization trends. The drive for rapid urban growth and often efficiency can lead to less equitable urban development. Think tanks such as the Overseas Development Institute have proposed policies that encourage labor-intensive growth as a means of absorbing the influx of low-skilled and unskilled labor. One problem these migrant workers are involved with is the growth of slums. In many cases, the rural-urban low skilled or unskilled migrant workers, attracted by economic opportunities in urban areas, cannot find a job and afford housing in cities and have to dwell in slums. Urban problems, along with infrastructure developments, are also fueling suburbanization trends in developing nations, though the trend for core cities in said nations tends to continue to become ever denser. Urbanization is often viewed as a negative trend, but there are positives in the reduction of expenses in commuting and transportation while improving opportunities for jobs, education, housing, and transportation. Living in cities permits individuals and families to take advantage of the opportunities of proximity and diversity. While cities have a greater variety of markets and goods than rural areas, infrastructure congestion, monopolization, high overhead costs, and the inconvenience of cross-town trips frequently combine to make marketplace competition harsher in cities than in rural areas. In many developing countries where economies are growing, the growth is often erratic and based on a small number of industries. For young people in these countries barriers exist such as, lack of access to financial services and business advisory services, difficulty in obtaining credit to start a business, and lack of entrepreneurial skills, in order for them to access opportunities in these industries. Investment in human capital so that young people have access to quality education and infrastructure to enable access to educational facilities is imperative to overcoming economic barriers. The existence of urban heat islands has become a growing concern over the years. An urban heat island is formed when industrial and urban areas produce and retain heat. Much of the solar energy that reaches rural areas is consumed by evaporation of water from vegetation and soil. In cities, where there is less vegetation and exposed soil, most of the sun's energy is instead absorbed by buildings and asphalt; leading to higher surface temperatures. Vehicles, factories and industrial and domestic heating and cooling units release even more heat. As a result, cities are often 1 to 3 °C (1.8 to 5.4 °F) warmer than surrounding landscapes. Impacts also include reducing soil moisture and a reduction in reabsorption of carbon dioxide emissions. In his book Whole Earth Discipline, Stewart Brand argues that the effects of urbanization are primarily positive for the environment. First, the birth rate of new urban dwellers falls immediately to replacement rate, and keeps falling, reducing environmental stresses caused by population growth. Secondly, emigration from rural areas reduces destructive subsistence farming techniques, such as improperly implemented slash and burn agriculture. In July 2013 a report issued by the United Nations Department of Economic and Social Affairs warned that with 2.4 billion more people by 2050, the amount of food produced will have to increase by 70%, straining food resources, especially in countries already facing food insecurity due to changing environmental conditions. The mix of changing environmental conditions and the growing population of urban regions, according to UN experts, will strain basic sanitation systems and health care, and potentially cause a humanitarian and environmental disaster. The occurrence of eutrophication in bodies of water is another effect large urban populations have on the environment. When rain occurs in these large cities, the rain filters down the pollutants such as CO2 and other green house gases in the air onto the ground below. Then, those chemicals are washed directly into rivers, streams and oceans, causing a decline in water quality and damaging marine ecosystems. Eutrophication is a process which causes hypoxic water conditions and algal blooms that may be detrimental to the survival of aquatic life.Harmful algal blooms, which produce dangerous toxins, thrive in eutrophic environments that are also rich in nitrogen and phosphorus. In these ideal conditions, they overtake surface water, making it difficult for other organisms to receive sunlight and nutrients. Overgrowth of algal blooms causes a decrease in overall water quality and disrupts the natural balance of aquatic ecosystems. Furthermore, as algal blooms die, CO2 is produced, causing a more acidic environment, a process known as acidifacation. Rapid growth of communities create new challenges in the developed world and one such challenge is an increase in food waste  also known as urban food waste. Food waste is the disposal of food products that can no longer be used due to unused products, expiration, or spoilage. The increase of food waste can raise environmental concerns such as increase production of methane gases and attraction of disease vectors. Landfills are the third leading cause of the release of methane, causing a concern on its impact to our ozone and on the health of individuals. Accumulation of food waste causes increased fermentation, which increases the risk of rodent and bug migration. An increase in migration of disease vectors creates greater potential of disease spreading to humans. Urbanization can have a large effect on biodiversity by causing a division of habitats and thereby alienation of species, a process known as habitat fragmentation. Habitat fragmentation does not destroy the habitat, as seen in habitat loss, but rather breaks it apart with things like roads and railways This change may affect a species ability to sustain life by separating it from the environment in which it is able to easily access food, and find areas that they may hide from predation  With proper planning and management, fragmentation can be avoided by adding corridors that aid in the connection of areas and allow for easier movement around urbanized regions. In the developing world, urbanization does not translate into a significant increase in life expectancy. Rapid urbanization has led to increased mortality from non-communicable diseases associated with lifestyle, including cancer and heart disease. Differences in mortality from contagious diseases vary depending on the particular disease and location. Urban health levels are on average better in comparison to rural areas. However, residents in poor urban areas such as slums and informal settlements suffer "disproportionately from disease, injury, premature death, and the combination of ill-health and poverty entrenches disadvantage over time." Many of the urban poor have difficulty accessing health services due to their inability to pay for them; so they resort to less qualified and unregulated providers. While urbanization is associated with improvements in public hygiene, sanitation and access to health care, it also entails changes in occupational, dietary and exercise patterns. It can have mixed effects on health patterns, alleviating some problems and accentuating others. One such effect is the formation of food deserts. Nearly 23.5 million people in the United States lack access to supermarkets within one mile of their home. Several studies suggest that long distances to a grocery store are associated with higher rates of obesity and other health disparities. Food deserts in developed countries often correspond to areas with a high-density of fast food chains and convenience stores that offer little to no fresh food. Urbanization has been shown to be associated with the consumption of less fresh fruits, vegetables, and whole grains and a higher consumption of processed foods and sugar-sweetened beverages. Poor access to healthy food and high intakes of fat, sugar and salt are associated with a greater risk for obesity, diabetes and related chronic disease. Overall, body mass index and cholesterol levels increase sharply with national income and the degree of urbanization. Food deserts in the United States are most commonly found in low-income and predominately African American neighborhoods. One study on food deserts in Denver, Colorado found that, in addition to minorities, the affected neighborhoods also had a high proportion of children and new births. In children, urbanization is associated with a lower risk of under-nutrition but a higher risk of overweight. Urbanization has also been associated with an increased risk for asthma as well. Throughout the world, as communities transition from rural to more urban societies, the number of people effected by asthma increases. The odds of reduced rates of hospitalization and death from asthmas has decreased for children and young adults in urbanized municipalities in Brazil. This finding indicates that urbanization may have a negative impact on population health particularly affecting people’s susceptibility to asthma. In low and middle income countries many factors contribute to the high numbers of people with asthma. Similar to areas in the United States with increasing urbanization, people living in growing cities in low income countries experience high exposure to air pollution, which increases the prevalence and severity of asthma among these populations. Links have been found between exposure to traffic-related air pollution and allergic diseases. Children living in poor, urban areas in the United States now have an increased risk of morbidity due to asthma in comparison to other low-income children in the United States. In addition, children with croup living in urban areas have higher hazard ratios for asthma than similar children living in rural areas. Researchers suggest that this difference in hazard ratios is due to the higher levels of air pollution and exposure to environmental allergens found in urban areas. Exposure to elevated levels of ambient air pollutants such as nitrogen dioxide (NO2), carbon monoxide (CO), and particulate matter with a diameter of less than 2.5 micrometers (PM2.5), can cause DNA methylation of CpG sites in immune cells, which increases children’s risk of developing asthma. Studies have shown a positive correlation between Foxp3 methylation and children’s exposure to NO2, CO, and PM2.5. Furthermore, any amount of exposure to high levels of air pollution have shown long term effects on the Foxp3 region. Despite the increase in access to health services that usually accompanies urbanization, the rise in population density negatively affects air quality ultimately mitigating the positive value of health resources as more children and young adults develop asthma due to high pollution rates. However, urban planning as well as emission control can lessen the effects of traffic-related air pollution on allergic diseases such as asthma. Historically crime and urbanization have gone hand in hand. The simplest explanation is that areas with a higher population density are surrounded by a greater availability of goods. Committing crimes in urbanized areas is also more feasible. Modernization has led to more crime as well. There is a greater awareness of the income gap between the rich and poor due to modern media. This leads to feelings of deprivation which can lead to crime. In some regions where urbanization happens in wealthier areas, a rise in property crime and a decrease in violent crime is seen. Data shows that there is an increase of crime in urbanized areas. Some factors include per capita income, income inequality, and overall population size. There is also a smaller association between unemployment rate, police expenditures and crime. The presence of crime also has the ability to produce more crime. These areas have less social cohesion, and therefore less social control. This is evident in the geographical regions that crime occurs in. As most crime tends to cluster in city centers, the further the distance from the center of the city, the lower the occurrence of crimes are. Migration is also a factor that can increase crime in urbanized areas. People from one area are displaced and forced to move into an urbanized society. Here they are in a new environment with new norms and social values. This can lead to less social cohesion and more crime. Although urbanization tends to produce more negative effects, one positive effect that urbanization has impacted is an increase in physical activity in comparison to rural areas. Residents of rural areas and communities in the United States have higher rates of obesity and engage in less physical activity than urban residents. Rural residents consume a higher percent of fat calories and are less likely to meet the guidelines for physical activity and more likely to be physically inactive. In comparison to regions within the United States, the west has the lowest prevalence of physical inactivity and the south has the highest prevalence of physical inactivity. Metropolitan and large urban areas across all regions have the highest prevalence of physical activity among residents. Barriers such as geographic isolation, busy and unsafe roads, and social stigmas lead to decreased physical activity in rural environments. Faster speed limits on rural roads prohibits the ability to have bike lanes, sidewalks, footpaths, and shoulders along the side of the roads. Less developed open spaces in rural areas, like parks and trails, suggest that there is lower walkability in these areas in comparison to urban areas. Many residents in rural settings have to travel long distances to utilize exercise facilities, taking up too much time in the day and deterring residents from using recreational facilities to obtain physical activity. Additionally, residents of rural communities are traveling further for work, decreasing the amount of time that can be spent on leisure physical activity and significantly decreases the opportunity to partake in active transportation to work. Neighborhoods and communities with nearby fitness venues, a common feature of urbanization, have residents that partake in increased amounts of physical activity. Communities with sidewalks, street lights, and traffic signals have residents participating in more physical activity than communities without those features. Having a variety of destinations close to where people live, increases the use of active transportation, such as walking and biking. Active transportation is also enhanced in urban communities where there is easy access to public transportation due to residents walking or biking to transportation stops. In a study comparing different regions in the United States, opinions across all areas were shared that environmental characteristics like access to sidewalks, safe roads, recreational facilities, and enjoyable scenery are positively associated with participation in leisure physical activity. Perceiving that resources are nearby for physical activity increases the likelihood that residents of all communities will meet the guidelines and recommendations for appropriate physical activity. Specific to rural residents, safety of outdoor developed spaces and convenient availability to recreational facilities matters most when making decisions on increasing physical activity. In order to combat the levels of inactivity in rural residents, more convenient recreational features, such as the ones discussed in this paragraph, need to be implemented into rural communities and societies. Urbanization factors that contribute to mental health can be thought of as factors that affect the individual and factors that affect the larger social group. At the macro, social group level, changes related to urbanization are thought to contribute to social disintegration and disorganization. These macro factors contribute to social disparities which affect individuals by creating perceived insecurity. Perceived insecurity can be due problems with the physical environment, such as issues with personal safety, or problems with the social environment, such as a loss of positive self-concepts from negative events. Increased stress is a common individual psychological stressor that accompanies urbanization and is thought to be due to perceived insecurity. Changes in social organization, a consequence of urbanization, are thought to lead to reduced social support, increased violence, and overcrowding. It is these factors that are thought to contribute to increased stress. It is important to note that urbanization or population density alone does not cause mental health problems. It is the combination of urbanization with physical and social risk factors that contribute to mental health problems. As cities continue to expand it is important to consider and account for mental health along with other public health measures that accompany urbanization. Recent developments, such as inner-city redevelopment schemes, mean that new arrivals in cities no longer necessarily settle in the centre. In some developed regions, the reverse effect, originally called counter urbanization has occurred, with cities losing population to rural areas, and is particularly common for richer families. This has been possible because of improved communications, and has been caused by factors such as the fear of crime and poor urban environments. It has contributed to the phenomenon of shrinking cities experienced by some parts of the industrialized world. When the residential area shifts outward, this is called suburbanization. A number of researchers and writers suggest that suburbanization has gone so far to form new points of concentration outside the downtown both in developed and developing countries such as India. This networked, poly-centric form of concentration is considered by some emerging pattern of urbanization. It is called variously exurbia, edge city (Garreau, 1991), network city (Batten, 1995), or postmodern city (Dear, 2000). Los Angeles is the best-known example of this type of urbanization. In the United States, this process has reversed as of 2011, with "re-urbanization" occurring as suburban flight due to chronically high transport costs. Rural migrants are attracted by the possibilities that cities can offer, but often settle in shanty towns and experience extreme poverty. The inability of countries to provide adequate housing for these rural migrants is related to overurbanization, a phenomenon in which the rate of urbanization grows more rapidly than the rate of economic development, leading to high unemployment and high demand for resources. In the 1980s, this was attempted to be tackled with the urban bias theory which was promoted by Michael Lipton. Urbanization can be planned urbanization or organic. Planned urbanization, i.e. : planned community or the garden city movement, is based on an advance plan, which can be prepared for military, aesthetic, economic or urban design reasons. Examples can be seen in many ancient cities; although with exploration came the collision of nations, which meant that many invaded cities took on the desired planned characteristics of their occupiers. Many ancient organic cities experienced redevelopment for military and economic purposes, new roads carved through the cities, and new parcels of land were cordoned off serving various planned purposes giving cities distinctive geometric designs. UN agencies prefer to see urban infrastructure installed before urbanization occurs. Landscape planners are responsible for landscape infrastructure (public parks, sustainable urban drainage systems, greenways etc.) which can be planned before urbanization takes place, or afterward to revitalize an area and create greater livability within a region. Concepts of control of the urban expansion are considered in the American Institute of Planners. As population continues to grow and urbanize at unprecedented rates, new urbanism and smart growth techniques are implemented to create a transition into developing environmentally, economically, and socially sustainable cities. Smart Growth and New Urbanism’s principles include walkability, mixed-use development, comfortable high-density design, land conservation, social equity, and economic diversity. Mixed-use communities work to fight gentrification with affordable housing to promote social equity, decrease automobile dependency to lower use of fossil fuels, and promote a localized economy. Walkable communities have a 38% higher average GDP per capita than less walkable urban metros (Leinberger, Lynch). By combining economic, environmental, and social sustainability, cities will become equitable, resilient, and more appealing than urban sprawl that overuses land, promotes automobile use, and segregates the population economically. ^ "Urbanization". MeSH browser. National Library of Medicine. Retrieved 5 November 2014. The process whereby a society changes from a rural to an urban way of life. It refers also to the gradual increase in the proportion of people living in urban areas. ^ "Urbanization in". demographic partitions. Retrieved 8 July 2015. 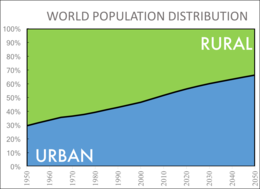 ^ "UN says half the world's population will live in urban areas by end of 2008". International Herald Tribune. Associated Press. 26 February 2008. Archived from the original on 9 February 2009. ^ "Urban life: Open-air computers". The Economist. 27 October 2012. Retrieved 20 March 2013. ^ a b "Urbanization". UNFPA – United Nations Population Fund. ^ Barney Cohen (2015). "Urbanization, City Growth, and the New United Nations Development Agenda". 3 (2). Cornerstone, The Official Journal of the World Coal Industry. pp. 4–7. ^ Gries, T. and Grundmann, R., 2018. Fertility and modernization: the role of urbanization in developing countries. Journal of International Development, 30(3), pp.493-506. ^ The Urbanization and Political Development of the World System: A comparative quantitative analysis. History & Mathematics 2 (2006): 115–53. ^ Paolo Malanima (2009). Pre-Modern European Economy: One Thousand Years (10th-19th Centuries). Brill Publishers. p. 244. ISBN 978-9004178229. ^ a b Christopher Watson (1993). K.B. Wildey; Wm H. Robinson (eds.). Trends in urbanisation. Proceedings of the First International Conference on Urban Pests. CiteSeerX 10.1.1.522.7409. ^ Annez, Patricia Clarke; Buckley, Robert M. (2009). "Urbanization and Growth: Setting the Context" (PDF). In Spence, Michael; Annez, Patricia Clarke; Buckley, Robert M. (eds.). Urbanization and Growth. ISBN 978-0-8213-7573-0. ^ Reba, Meredith; Reitsma, Femke; Seto, Karen C. (7 June 2016). "Spatializing 6,000 years of global urbanization from 3700 BC to AD 2000". Scientific Data. 3: 160034. Bibcode:2016NatSD...360034R. doi:10.1038/sdata.2016.34. ISSN 2052-4463. PMC 4896125. PMID 27271481. ^ "Research Data–Seto Lab". www.urban.yale.edu. Retrieved 9 July 2016. ^ "The History of Urbanization, 3700 BC – 2000 AD". YouTube. Retrieved 24 September 2018. ^ a b Fuller, Thomas (5 June 2012). "Thai Youth Seek a Fortune Away From the Farm". New York Times. Retrieved 5 June 2012. ^ Jitnarin, Nattinee; Kosulwat, Vongsvat; Rojroongwasinkul, Nipa; Boonpraderm, Atitada; Haddock, Christopher K.; Poston, Walker S. C.; Jitnarin, Nattinee; Kosulwat, Vongsvat; Rojroongwasinkul, Nipa (21 January 2010). "Risk Factors for Overweight and Obesity among Thai Adults: Results of the National Thai Food Consumption Survey". Nutrients. 2 (1): 60–74. doi:10.3390/nu2010060. PMC 3257614. PMID 22253992. ^ "Early Death Assured In India Where 900 Million Go Hungry". Bloomberg. 13 June 2012. Retrieved 13 June 2012. ^ a b "Urbanization, gender and urban poverty:Paid work and unpaid carework in the city". UNFPA. 2012. ^ Benedictus, Leo (12 May 2017). "Blowing in the wind: why do so many cities have poor east ends?". The Guardian – via The Guardian. ^ Todaro, Michael P. (1969). "A Model of Labor Migration and Urban Unemployment in Less Developed Countries". The American Economic Review. 59 (1): 148. ^ Glaeser, Edward (Spring 1998). "Are Cities Dying?". The Journal of Economic Perspectives. 12 (2): 139–60. doi:10.1257/jep.12.2.139. ^ Brand, Stewart. "Whole Earth Discipline – annotated extract". Retrieved 29 November 2009. ^ Nowak, J. (1997). "Neighborhood Initiative and the Regional Economy". Economic Development Quarterly. 11: 3–10. doi:10.1177/089124249701100101. ^ Using the Gall-Peters Projection it is estimated that come 2015 the worlds urban population is set to exceed 4 billion, most of this growth is expected in Africa and Asia and China to be 50% urbanized. ^ "State of the World Population 2014". UNFPA. 2014. ^ "World Economic and Social Survey (WESS) 2013" World Economic and Social Affairs. July 2013. ^ Auber, Tamar (17 July 2013) "Climate change and rapid urban expansion in Africa threaten children’s lives." UNEARTH News. Retrieved 10 August 2013. ^ Jiang, Leiwen; Hoepf Young, Malea; Hardee, Karen (2008). "Population, Urbanization, And The Environment". World Watch. 21 (5): 34–39. ^ "About Eutrophication | World Resources Institute". www.wri.org. Retrieved 18 November 2018. ^ Ramesh, R; Lakshmi, A; Purvaja, R; Costanzo, S.D; Kelsey, R.H; Hawkey, J; Datta, A; Dennison, W.C (2013). "Eutrophication and Ocean Acidification" (PDF). ^ a b "National Climate Assessment". National Climate Assessment. Retrieved 18 November 2018. ^ Feely, Richard A.; Alin, Simone R.; Newton, Jan; Sabine, Christopher L.; Warner, Mark; Devol, Allan; Krembs, Christopher; Maloy, Carol (August 2010). "The combined effects of ocean acidification, mixing, and respiration on pH and carbonate saturation in an urbanized estuary". Estuarine, Coastal and Shelf Science. 88 (4): 442–449. Bibcode:2010ECSS...88..442F. doi:10.1016/j.ecss.2010.05.004. ISSN 0272-7714. ^ Fisheries, NOAA (9 September 2018). "Understanding Ocean Acidification | NOAA Fisheries". www.fisheries.noaa.gov. Retrieved 18 November 2018. ^ "Ocean Acidification". Smithsonian Ocean. Retrieved 18 November 2018. ^ Thyberg, Krista L.; Tonjes, David J. (2016). "Drivers of food waste and their implications for sustainable policy development". Resources, Conservation and Recycling. 106: 110–123. doi:10.1016/j.resconrec.2015.11.016. ISSN 0921-3449. ^ "Article: "Urban Food Waste generation: challenges and opportunities" Journal: Int. J. of Environment and Waste Management, 2009 Vol.3 No.1/2 pp.4 - 21 Abstract: Greater economic activity and a wider economic gap between rural and urban areas is leading to accelerated urbanisation and the generation of 35% more Urban Food Waste (UFW) from 2007 to 2025. Besides landfilling, this paper examines the advantages of introducing onsite composting and anaerobic digestion for the environmental recycling of UFW and the lowering of handling cost. For Asia and Africa, these solutions for UFW could reduce the mass of MSW by 43% and 55%, respectively, thus help there cities manage almost all of their MSW. For North America and Europe, such practice could reduce earth warming trends. - Inderscience Publishers - linking academia, business and industry through research". www.inderscience.com. Retrieved 7 October 2018. ^ a b Adhikari, Bijaya K.; Barrington, Suzelle; Martinez, José (October 2006). "Predicted growth of world urban food waste and methane production". Waste Management & Research: The Journal of the International Solid Wastes and Public Cleansing Association, ISWA. 24 (5): 421–433. doi:10.1177/0734242X06067767. ISSN 0734-242X. PMID 17121114. ^ Adhikari, Bijaya K.; Barrington, Suzelle F.; Martinez, Jose (2009). "Urban Food Waste generation: challenges and opportunities" (PDF). International Journal of Environment and Waste Management. 3 (1/2): 4. doi:10.1504/ijewm.2009.024696. ISSN 1478-9876. ^ "Vector-borne diseases". World Health Organization. Retrieved 19 October 2018. ^ EPA,OA, US (23 December 2015). "Overview of Greenhouse Gases | US EPA". US EPA. Retrieved 16 October 2018. ^ Venkateswaran, Sandhya (1994). "Managing Waste: Ecological, Economic and Social Dimensions". Economic and Political Weekly. 29 (45/46): 2907–2911. JSTOR 4401996. ^ Elmqvist, Thomas; Zipperer, Wayne; Güneralp, Burak (2016). "10". Urbanization, habitat loss, biodiversity decline: solution pathways to break the cycle. pp. 139–151. ^ Liu Z, He C, Wu J (2016). "The Relationship between Habitat Loss and Fragmentation during Urbanization: An Empirical Evaluation from 16 World Cities". PLOS One. 11 (4): e0154613. Bibcode:2016PLoSO..1154613L. doi:10.1371/journal.pone.0154613. PMC 4849762. PMID 27124180. ^ Skagen, Susan K.; Yackel Adams, Amy A.; Adams, Rod D. (2005). "Nest Survival Relative to Patch Size in a Highly Fragmented Shortgrass Prairie Landscape". The Wilson Bulletin. 117: 23–34. doi:10.1676/04-038. ^ McKinney, Michael L. (29 January 2008). "Effects of urbanization on species richness: A review of plants and animals". Urban Ecosystems. 11 (2): 161–176. doi:10.1007/s11252-007-0045-4. ISSN 1083-8155. ^ McKinney, Michael (October 2002). "Urbanization, Biodiversity, and Conservation" (PDF). BioScience. 52. ^ "In crowded Hlaing Tharyar township, slums sit next to gated communites | Coconuts Yangon". 22 February 2016. ^ a b c Eckert S, Kohler S (2014). "Urbanization and health in developing countries: a systematic review". World Health & Population. 15 (1): 7–20. doi:10.12927/whp.2014.23722. PMID 24702762. ^ a b Allender S, Foster C, Hutchinson L, Arambepola C (November 2008). "Quantification of urbanization in relation to chronic diseases in developing countries: a systematic review". Journal of Urban Health. 85 (6): 938–51. doi:10.1007/s11524-008-9325-4. PMC 2587653. PMID 18931915. ^ Block, Jason P.; Subramanian, S. V. (8 December 2015). "Moving Beyond "Food Deserts": Reorienting United States Policies to Reduce Disparities in Diet Quality". PLOS Medicine. 12 (12): e1001914. doi:10.1371/journal.pmed.1001914. ISSN 1549-1676. PMC 4672916. PMID 26645285. ^ a b c Ghosh-Dastidar, Bonnie; Cohen, Deborah; Hunter, Gerald; Zenk, Shannon N.; Huang, Christina; Beckman, Robin; Dubowitz, Tamara (2014). "Distance to Store, Food Prices, and Obesity in Urban Food Deserts". American Journal of Preventive Medicine. 47 (5): 587–595. doi:10.1016/j.amepre.2014.07.005. PMC 4205193. PMID 25217097. ^ Cooksey-Stowers, Kristen; Schwartz, Marlene B.; Brownell, Kelly D. (14 November 2017). "Food Swamps Predict Obesity Rates Better Than Food Deserts in the United States". International Journal of Environmental Research and Public Health. 14 (11): 1366. doi:10.3390/ijerph14111366. PMC 5708005. PMID 29135909. ^ Stilley, Megan. University of Colorado at Denver, ProQuest Dissertations Publishing, 2012. 1509386. ^ a b Ponte, Eduardo Vieira; Cruz, Alvaro A.; Athanazio, Rodrigo; Carvalho-Pinto, Regina; Fernandes, Frederico L. A.; Barreto, Mauricio L.; Stelmach, Rafael (1 February 2018). "Urbanization is associated with increased asthma morbidity and mortality in Brazil". The Clinical Respiratory Journal. 12 (2): 410–417. doi:10.1111/crj.12530. ISSN 1752-699X. PMID 27400674. ^ Cruz, Álvaro A.; Stelmach, Rafael; Ponte, Eduardo V. (1 June 2017). "Asthma prevalence and severity in low-resource communities". Current Opinion in Allergy and Clinical Immunology. 17 (3): 188–193. doi:10.1097/aci.0000000000000360. ISSN 1528-4050. PMID 28333691. ^ a b Carlsten, Christopher; Rider, Christopher F. (1 April 2017). "Traffic-related air pollution and allergic disease". Current Opinion in Allergy and Clinical Immunology. 17 (2): 85–89. doi:10.1097/aci.0000000000000351. ISSN 1528-4050. PMID 28141628. ^ Keet, Corinne A.; Matsui, Elizabeth C.; McCormack, Meredith C.; Peng, Roger D. (September 2017). "Urban residence, neighborhood poverty, race/ethnicity, and asthma morbidity among children on Medicaid". Journal of Allergy and Clinical Immunology. 140 (3): 822–827. doi:10.1016/j.jaci.2017.01.036. PMID 28283418. ^ Lin, Sheng-Chieh; Lin, Hui-Wen; Chiang, Bor-Luen (1 September 2017). "Association of croup with asthma in children". Medicine. 96 (35): e7667. doi:10.1097/md.0000000000007667. ISSN 0025-7974. PMC 5585480. PMID 28858086. ^ Prunicki, Mary; Stell, Laurel; Dinakarpandian, Deendayal; de Planell-Saguer, Mariangels; Lucas, Richard W.; Hammond, S. Katharine; Balmes, John R.; Zhou, Xiaoying; Paglino, Tara (5 January 2018). "Exposure to NO2, CO, and PM2.5 is linked to regional DNA methylation differences in asthma". Clinical Epigenetics. 10: 2. doi:10.1186/s13148-017-0433-4. ISSN 1868-7083. PMC 5756438. PMID 29317916. ^ Gumus, E. (2004). Crime in urban areas: An empirical investigation. ^ Bruinsma, G. J. (2007). Urbanization and urban crime: Dutch geographical and environmental research. Crime and Justice, 35(1), 453-502. ^ Malik, A. A. (2016). Urbanization and Crime: A Relational Analysis. J. HUMAN. & Soc. Scl., 21, 68-69. ^ a b c d e Umstattd Meyer, M. Renée; Moore, Justin B.; Abildso, Christiaan; Edwards, Michael B.; Gamble, Abigail; Baskin, Monica L. (2016). "Rural Active Living". Journal of Public Health Management and Practice. 22 (5): E11–E20. doi:10.1097/phh.0000000000000333. PMC 4775461. PMID 26327514. ^ a b Befort, Christie A.; Nazir, Niaman; Perri, Michael G. (1 September 2012). "Prevalence of Obesity Among Adults From Rural and Urban Areas of the United States: Findings From NHANES (2005-2008)". The Journal of Rural Health. 28 (4): 392–397. doi:10.1111/j.1748-0361.2012.00411.x. ISSN 1748-0361. PMC 3481194. PMID 23083085. ^ a b c d REIS, JARED P.; BOWLES, HEATHER R.; AINSWORTH, BARBARA E.; DUBOSE, KATRINA D.; SMITH, SHARON; LADITKA, JAMES N. (1 December 2004). "Nonoccupational Physical Activity by Degree of Urbanization and U.S. Geographic Region". Medicine & Science in Sports & Exercise. 36 (12): 2093–2098. doi:10.1249/01.mss.0000147589.98744.85. ISSN 0195-9131. ^ a b c Seguin, Rebecca; Connor, Leah; Nelson, Miriam; LaCroix, Andrea; Eldridge, Galen (2014). "Understanding Barriers and Facilitators to Healthy Eating and Active Living in Rural Communities". Journal of Nutrition and Metabolism. 2014: 146502. doi:10.1155/2014/146502. ISSN 2090-0724. PMC 4276670. PMID 25574386. ^ a b c Sallis, James F.; Floyd, Myron F.; Rodríguez, Daniel A.; Saelens, Brian E. (7 February 2012). "Role of Built Environments in Physical Activity, Obesity, and Cardiovascular Disease". Circulation. 125 (5): 729–737. doi:10.1161/circulationaha.110.969022. ISSN 0009-7322. PMC 3315587. PMID 22311885. ^ Luciano (2016). "Perceived insecurity, mental health and urbanization: Results from a multicentric study". International Journal of Social Psychiatry. 62 (6): 252–61. doi:10.1177/0020764016629694. PMID 26896027. ^ Berry, Helen (6 December 2007). "'Crowded suburbs' and 'killer cities': a brief review of the relationship between urban environments and mental health". NSW Public Health Bulletin. 18 (12): 222–7. doi:10.1071/NB07024. PMID 18093463. ^ Srivastava, Kalpana (July 2009). "Urbanization and mental health". Industrial Psychiatry Journal. 18 (2): 75–6. doi:10.4103/0972-6748.64028. PMC 2996208. PMID 21180479. ^ Sridhar, K. S. (2007). "Density gradients and their determinants: Evidence from India". Regional Science and Urban Economics. 37 (3): 314–44. doi:10.1016/j.regsciurbeco.2006.11.001. ^ Bora, Madhusmita (1 July 2012). "Shifts in U.S. housing demand will likely lead to the re-urbanization of America". Nwitimes.com. Retrieved 20 March 2013. ^ Davis, Kingsley; Hertz Golden, Hilda (1954). "Urbanization and the Development of Pre-Industrial Areas". Economic Development and Cultural Change. 3 (1): 6–26. doi:10.1086/449673. ^ Varshney, A. (ed.) 1993. "Beyond Urban Bias", p. 5. London: Frank Cass. ^ Lovelace, E.H. (1965). "Control of urban expansion: the Lincoln, Nebraska experience". Journal of the American Institute of Planners. 31:4: 348–52.
" Seeing like a state: How Certain Schemes to Improve the Human Condition Have Failed" by James C. Scott, Publisher : Yale University Press. 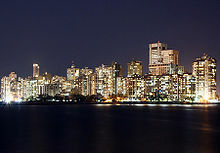 Wikimedia Commons has media related to Urbanization.